On a crisp fall morning a kindly neighbor mother and I were discussing household chores while riding bikes together downtown to work. How do you do it all? How do you keep up and not get overwhelmed? Do the other family members have assigned chores or do you let the jobs get done at will? On the topic of laundry she made mention of the fact that she did a load of laundry every night before bed. Me, mother of one: Really? Every night? She, mother of two: You got it. Every weekday night. Otherwise I get too far behind and I will never be able to catch up. Me, mother of one: I can not believe you have that much laundry. I could not make sense of the information she was downloading to my brain. It felt so confusing. Five loads of laundry a week. No way! That's a boatload of laundry. Three active children. A backyard with a dirt pit on one side. Soccer players and dancers and Tonka truck explorers. Honestly, I would be happy if I only had five loads of laundry a week. When I am on the ball—i.e. changing the bedsheets and alternating the bath towels as I should—I have at least ten loads to work into my busy schedule. Half of my issue probably lies in the fact that I'm a laundry snob and I don't like anyone else to touch my laundry. I feel irritated when the children try to help. I prefer to do it all myself. I'm a little OCD like that. This compulsion to do it all myself leads to certain problems. Regular problems. Can you guess the most common issue in my home before 7am any given weekday morning? That's right. You got it. "Where are my socks? Doesn't he have any socks? Go find your socks child. Mommmmm... can you find my socks? Sweetie, how 'bout you just wear your Crocs today." 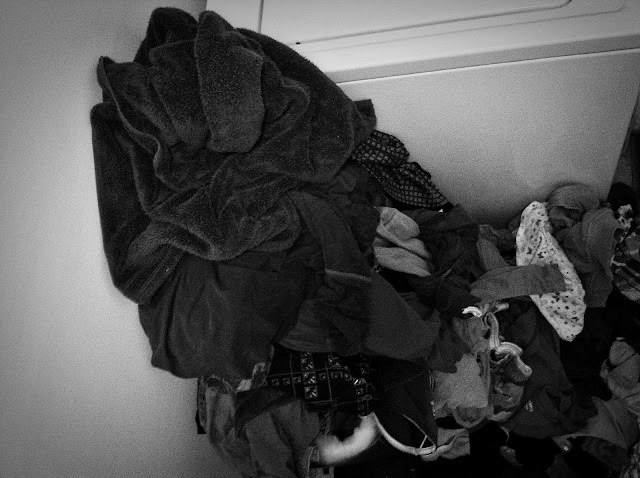 The thing about the laundry in my house—as I'm sure you can relate—is that it keeps growing. No matter how many loads I do, or how diligently I attempt to stay on top of it, the pile grows and grows and grows. If I don't do laundry for two days in a row, I'm swimming in it. In my opinion, the laundry is complete when my laundry basket is no longer flowing over. A full to the brim laundry basket gives me utter satisfaction of a job well done. I'll admit, I haven't seen the bottom of my laundry basket since becoming a mother over seven years ago. This year I've made some adjustments to my weekly schedule in an attempt to make sure everyone has clean socks and bedsheets and towels and jeans when they need them. The system isn't perfect, but it gets me closer to my goal of a laundry room I can walk in. For years now my system of accomplishing all I needed to accomplish in day fell under a category I like to call Buffet Style Task Fulfillment. Do a little of this and a little of that, everyday, all day. Each day I would attempt some desk work, some cooking, some errands, some cleaning, some laundry, some exercise, some socializing, some kiddie activities, so on and so forth. Turns out this Buffet Style approach to getting anything done left me accomplishing little to nothing in a day, and feeling utterly frustrated when the day was over for lack of completing any one task well. The pressure to do it all was overwhelming and underserving. So this year I've instituted Homemaking Day—a day where I base myself entirely in my home focusing on cooking meals for the week, deep cleaning funky corners and hammering through the laundry pile. It is imperative to the success of my day that I don't confuse my intentions by attempting to do desk work, or pay bills, or do any amount of socializing. Homemaking Day has brought me great joy and satisfaction at the end of the day. By the time the kids are ready to be picked up from school, I can proudly say that I've cooked two to three dinners, made a batch of chai for the week, completed three to five loads of laundry (including the folding and putting away), and scrubbed some low to the ground corner that was getting a little too funky for comfort. The best part about Homemaking Day is that it has brought my family a less stressed-out mother, meals waiting in the refrigerator ready to eat, semi-sanitary conditions in the places that matter most, and best of all, clean socks. For all of you excited to implement Homemaking Day into your weekly routine, be warned, it's no walk in the park. To accomplish enough in the day to feel satisfied, you'll be running. I like to call it aerobic householding. Picture yourself running up and down the stairs putting laundry away like you were on a game show ready to win a $10,000 prize for the most loads of laundry and cleanest folding table in the shortest amount of time. Picture yourself leaning over three boiling pots on the stovetop and one steaming oven. Picture yourself dancing to the country music station blaring from the radio in your kitchen and smiling. Working your tail off in the home just one day a week makes for a much more relaxed remaining six days. Give Homemaking Day a try this week. I'd love to hear how it works to meet your householding needs—not to mention your aerobic needs. Good luck and happy homemaking, friends!